Grow it for its ornamental beauty alone. Compact 1’ plants yield tender, blue-green, finely crinkled leaves that are quite delicious and rich in vitamin A. Extra cold-hardy and aphid-resistant. Great fresh or cooked, either before or after a frost, when leaves become very sweet. Harvest baby leaves for salad, then continue to pick the larger leaves from the middle outward to braise or sauté. Use thinnings or sow a heavily-seeded row every 10-14 days for baby greens. Photo courtesy of Baker Creek Heirloom Seed. Start indoors: 4-6 weeks before last frost. Sow ½” deep in sterile planting medium. Transplant spacing: Thin seedlings to 12-24” apart. 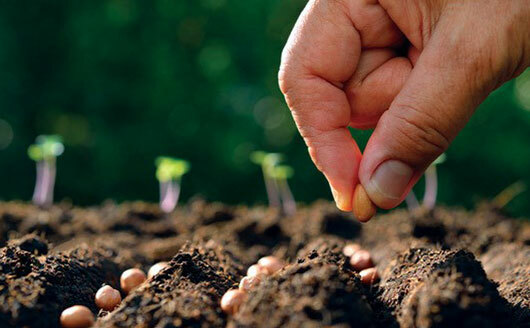 Sow another planting in mid/late summer for fall crops. Sow outdoors when temperatures reach 55º. Kale did great in my garden last year and I'd like to try this variety this summer. I'll start by saying I don't know a lot about harvest timing on kale, this was my first time growing any. I decided to plant in late March when the frosts just wouldn't stop coming. Germination was highly successful, I estimate 60-80% of seeds planted. Once thinned, the plants grew slowly until later in summer (~July). Since then, and still now into October, growth continues and my wife and I have been using it frequently in mixed salads. We have enough to share with 1-2 friends for similar use and I planted just one 3' row, this was thinned to 4 plants.